Ivory dupion christening gown with criss-cross braiding on the bodice. The gown is fully lined in polycotton, including petticoat under the skirt. The lining is soft and cool against baby's skin. There is a zip fastening to the back, making it easy to put on and take off. The gown comes complete with a matching hat. If your required size is out of stock please select the "Made to order" option above and your gown will be made and sent to you within 4 to 6 weeks. Please enter the size you require in the comment box above if selecting made to order. 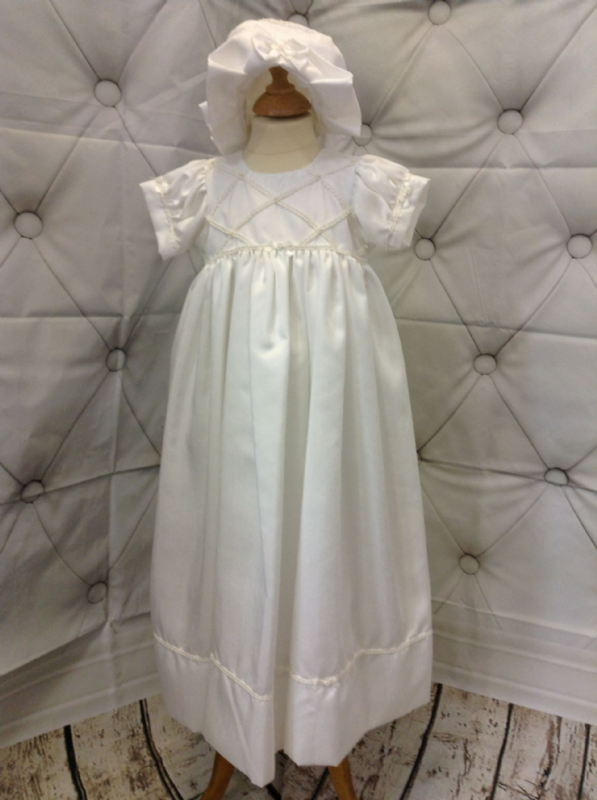 This gown is part of our bespoke christening wear collection, so sizes other than those listed above can be made. Variations to colour and design are also possible for this collection (e.g. longer length, alternative lace, alternative hat styles). Please select the "Bespoke order" option above and enter details in the comment box above. If you would like to discuss your requirements, please contact us. Bespoke orders require a minimum of 4 to 6 weeks notice and cost an additional £5. Bespoke orders are non-returnable. Please review size guide below to ensure correct size before ordering. If you would like advice on how to measure baby please do not hesitate to get in touch and we can talk you through. If the sizes below don't seem right for your baby then you can order a bespoke size (as noted above). The below sizes are finished sizes of the dress, allow around 1" of room in measurements to ensure a good fit. Please note: This dress is machine washable.